TORONTO – They didn’t necessarily know it at the time as they were fighting for their basketball lives, but for weeks now the Orlando Magic have been preparing for the daunting challenge that they faced on Saturday while opposite the rugged Toronto Raptors in the first game of the NBA playoffs. They needed poise in the face of adversity, resiliency when things looked grim and inner peace when Scotiabank Arena roared with ear-splitting noise. Most of all, the Magic needed a hero to make the kind of decisive play that can shift the balance of a playoff series when usually reliable leaders Nikola Vucevic and Terrence Ross struggled to get open looks. D.J. Augustin, the supposedly too-short, too-fragile point guard many doubted before this season ever began, was ready for the biggest moment of his 11-year NBA career, delivering a shot heard all through the basketball word. With the Magic down two inside the final minute, Augustin knifed into the lane for a tying layup. Then, seconds later, Augustin seized upon a miscommunication by Toronto’s defense and drilled a 3-pointer that sent Orlando on its way to a stunning and stirring 104-101 defeat of the Raptors in Game 1. Seventh-seeded Orlando, which is in its first playoff series in seven years, brazenly snatched homecourt advantage away from a Toronto team that was heavily favored to breeze through this first-round series. What might have been forgotten is that the Magic came into the playoffs as one of the hottest teams in all the NBA, going 22-9 since Jan. 31 to sling-shot themselves into the playoff hunt. Even more impressive, the Magic won 11 of the last 13 at the end of the regular season – many of those wins coming on the road and when their playoff lives were at stake – so it came as little shock to them when they weathered Saturday’s adversity and found a way to gut out the victory. Nobody made more plays that Augustin, the 6-foot, 183-pound guard who obliterated Toronto all-star Kyle Lowry in one of the key matchups of the series. Augustin had 19 points by halftime and finished with 25 points by making nine of 13 shots, four of five 3-pointers and three of four free throws. Lowry – who has an infamous history of struggling in the playoffs – was in another funk all of Saturday, missing all seven of his shots, six 3-pointers and even two free throws to go scoreless over 34 minutes. Augustin, meanwhile, forced Toronto into major defensive adjustments. The Raptors shifted their two best defenders – Leonard and Green – onto him at various points in the game. When it came time for the biggest moment of the night – and certainly the biggest moment of Augustin’s career – he noticed confusion between Leonard and center Marc Gasol and confidently drilled the three that sent the Magic on their way to the Game 1 win. Typical of the level-headed, under-control Augustin, he recognized the play, made the perfect read and came through for a Magic team that has leaned on his steadiness all season. What made Orlando’s victory even more impressive was the fact that it was able to win despite shooting just 40 percent from the floor and getting pedestrian scoring nights from Nikola Vucevic (11 points on three-of-14 shooting), Terrence Ross (10 points on two-of-11 shooting) and Aaron Gordon (10 points on three-of-10 shooting). Vucevic, Orlando’s only all-star of the past seven seasons, has led the team in scoring and rebounding all season. Meanwhile, Ross came into Game 1 riding the best run of his NBA career after pumping in 23, 25, 26 and 35 points in the final four games of the regular season. When Toronto turned its focus toward taking Vucevic out of the game with double teams and to stop Ross’ shooting with defenders pressed up into him, Orlando had other players ready to step up. Second-year forward Jonathan Isaac had 11 points – none bigger than the corner 3-pointer he hit with 1:57 remaining. Michael Carter-Williams scored 10 points, grabbed five rebounds and handed out two assists despite getting his nose bloodied late in the game by a Lowry hit. And center Khem Birch, a native of Montreal, returned to his home country and chipped in six points, seven rebounds, an assist and a steal. Leonard, a former Finals MVP and Defensive Player of the Year, scored 25 points and put Toronto up 101-99 with 1:02 to play with a clutch baseline jumper. He made his first four shots for 11 first-quarter points, but it was mostly a struggle for him afterward because of the gritty defense of Gordon. He held Leonard for 18 points a game and 42 percent shooting in three games during the regular season. On Saturday, Leonard made 10 of 18 shots – but only six of 14 after the first period. ``I wasn’t physical enough at the beginning of the game and I was getting hit on screens,’’ Gordon said of his defense on Leonard, who often ran off Gasol picks to free himself. ``He still had a pretty good game, but I was trying to be more physical on him and make it difficult for him. Orlando came into the playoffs as one of the NBA’s hottest teams, winning 22 of their final 31 regular-season games (third-best in the NBA since Jan. 31). Because they were once 20-31, the Magic have been in must-win mode for weeks and they responded time and again down the stretch. Little did they know it at the time, but those experiences hardened them for the difficulties that they faced on Saturday. Toronto, meanwhile, came into Saturday’s game with a bizarre playoff history in Game 1s, and its troubles extended to this series. Oddly, the Raptors are now just 2-14 all-time in Game 1s of playoff series. They went from 2001 to 2018 without winning a Game 1, dropping 10 series openers in a row. Now, they have another two-game skid in Game 1s dating back to last spring against Cleveland and Saturday while being beaten by the Magic. Both teams will have plenty of time to make adjustments and counter moves prior to Game 2. The second showdown will be Tuesday at 8 p.m. in a game that will be televised by both Fox Sports Florida and TNT. Gordon said the Magic have to not get comfortable having won a game and need to push for a 2-0 start come Tuesday. Up seven at the half following their dominant stretch in the second period, the Magic saw their advantage disappear early in the third period. Toronto opened the second half with a 9-2 run – 17-2 when combining the last eight points of the first half to take a lead they would hang onto and take into the fourth. Orlando hung tough through its struggles and trailed just 76-75 after three periods. Down as much as eight points in the early going while Leonard had it rolling, the Magic showed off their road resiliency once again and grabbed control of the game in the second quarter. The Magic broke a 39-all tie by going on a breathtaking 18-2 run where they poured in shots from all corners of Scotiabank Arena. After making just 11 of their first 32 shots and three-of-eight from 3-point range, Orlando went on an offensive tear where it drilled nine of its next 14 shots and five of six on threes. Augustin dominated his head-to-head matchup against Lowry every way possible in the early going. Augustin hit seven of nine shots in the first half – and all three of his 3-pointers and both of his free throws – for 19 early points. Augustin’s most heady play of the night came when he intercepted a Leonard pass, dribbled hard to the rim and flipped a behind-the-back pass to Vucevic for a layup that put the Magic up 57-41 late in the half. Augustin was there for the Magic in the first half with the 19 points and he was there in the end to make the game-winner and the most significant shot of his career. Afterward, he took great delight in being the player to lift the Magic to their biggest win in at least seven years. 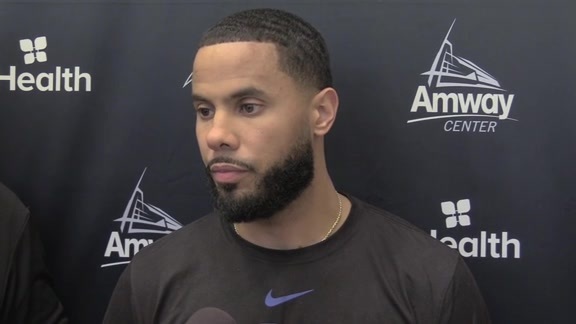 Much like an overlooked Magic team in this series, Augustin has been doubted for years, but he proved himself plenty tough and clutch enough when Orlando needed him on Saturday. 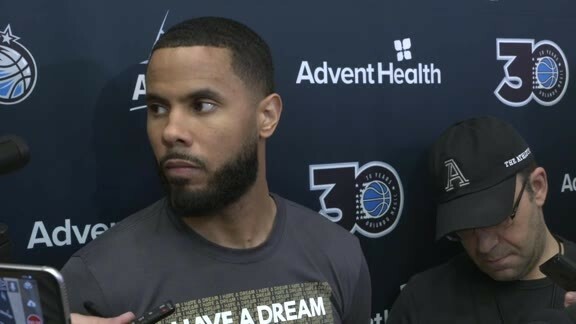 ``Honestly, I don’t listen to that kind of stuff and I never did,’’ Augustin said with conviction, referring to doubters. ``I’ve been the same size since I was (young) and nobody expected me to be in the NBA and I’m going into my 12th year. I don’t listen to what the outside people say. I only care about my family, people close to me and my teammates. If they believe in me, and my coaches believed in me from the jump, and that’s all I’ve needed.